Whether you decide to buy an aluminum product, a steel unit, or one that combines the two types of metal, make sure you take time to fit the jobs you’ll perform to the lifting capacity of the jack.Matching your tools to the work that will be performed is the most important factor in this decision. 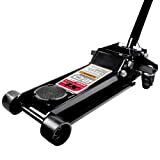 This floor jack from Pittsburgh Automotive is hefty enough at 79 pounds, but the overall size of 28” x 12” x 10” should be comfortable even for the DIY garage mechanic. Buyers should find it works well for cars that are low to the ground and for a heavier SUV. This jack has a low enough profile to handle most car situations, yet the upper end of the lift range is 19.75 inches. It also delivers excellent control. When pressure is released, the jack returns to lowered position slowly. Outside measurement of wheel width is just under 11 inches, which makes it good for working in smaller spaces. Six pumps of the handle should give you full extension. Pittsburgh Automotive includes metal wheels, which will be important in almost every working situation, especially on rougher concrete. The 2.78-inch, low-profile makes it excellent for the low-riding vehicles. The rubber lift pad is not provided, but a 3.5-inch pad will work within the “dog ears” that rise from the lift platform. Some lighter jacks in this category have handles located at the side for carrying purposes. This unit does not, but at 79 pounds it might be better to roll it rather than lift it. Warranty may vary with seller or contact manufacturer. This jack will be a good choice for those who need to lift a higher-profile vehicle, thanks to the extra-long neck designed in by Torin. It is also lighter than some in the 3-ton category at 43 pounds. With its capacity and 21-inch lift range, this should be a good choice for those working on SUVs and trucks. As with most units in this group, it offers rear, caster wheels for better mobility. Overall dimensions are 26” x 11” x 8” Perhaps the most outstanding feature of the Torin Big Red that puts it on the list for best floor jack is the 21-inch lift range. It also has a higher profile when in the lowered position, which makes it best for trucks and SUVs. This jack has a one-piece handle with rubber grip. The light weight of this jack makes it ideal for those who need to move equipment around on a regular basis. It’s also a good choice for higher vehicles, because of the 6-inch profile. Caster wheels are always a good idea, even for this lighter unit. 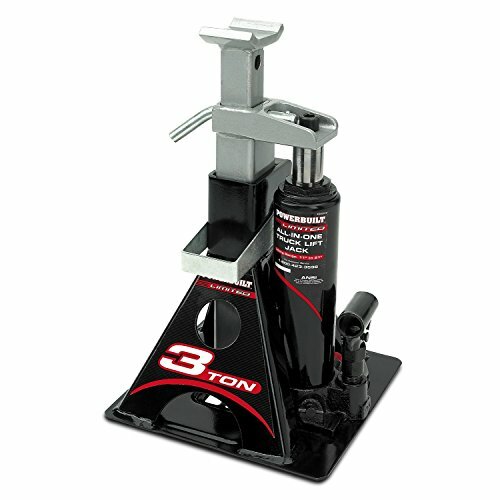 If you’re familiar with a bottle jack, this floor jack releases pressure in the same way. Use the handle to fit over the release. One year warranty is standard. The wheels seem to be a bit light in weight for a 3-ton jack, but should handle the rated capacity. While the lift range extends to 21 inches, the 6-inch bottom end of the lift range could be a problem for some users. The lift plate is smaller than on some comparable units. It’s important to notice the one word in the product title that separates this jack from the rest – “bottle.” This upright design comes with a wide base of durable steel to provide stability, as well as the safety-bar locks you need to set your height. It’s a bottle jack and jack stand in one product. Even with the upright design you’ll be able to use it on vehicles as low as 8.5 inches, and you can move it easily with its weight of about 22 pounds. Lift up to 21 inches with the Powerbilt combination jack and jack stand. Overall dimensions are 9.75” x 9.75” x 12.25” It could be the right choice for many small SUVs and cars, as well as for working on floor joists and general construction. The combination of durable bottle jack and jack stand base is one of the key features of this product. Quality from one jack to the next seems to be consistent. Quality of construction makes this light-but-durable jack worth the investment. Great option for those who want a heftier jack to carry in the vehicle. You may have to put pressure on the top of the lift arm to get the jack to go down as it should. Inconsistent fluid pressure from one unit to another, though this could just be luck of the draw, so to speak. You must contact manufacturer to get warranty information. If you’re looking for a dependable jack in the 2-ton category, the Arcan XL20 could be right for you. This floor jack has the two-piece handle with bumper pad you may have seen in other 2-ton and 3-ton jacks. It has the necessary safety-valve protection as well as steel construction for durability. It weighs in at less than 70 pounds. Among the features you’ll appreciate from Arcan are the dual-pump design for quicker lifting, the covered handle to prevent vehicle damage, control with the universal-joint release, and the compact size in a jack that still delivers “full size” performance. Metal wheels will also contribute to long-term service. At the top of the list is the steel construction, which gives this jack the heft you need to do real work, yet it weighs in at 67 pounds. It’s also an efficient tool thanks to the dual-pump design and the safety valve to prevent overload. Overall size is 26” x 6.3” x 13.2” a compact size that will be easy to use in the garage or the pro shop. Lift range extends from a low 3.5 inches to 18.5 inches. It comes with a one-year warranty. If you’re obsessed with the clean finish and appearance of your tools, you may have to perform some light sanding and other finish work. But, the jack does the work it’s designed to do. 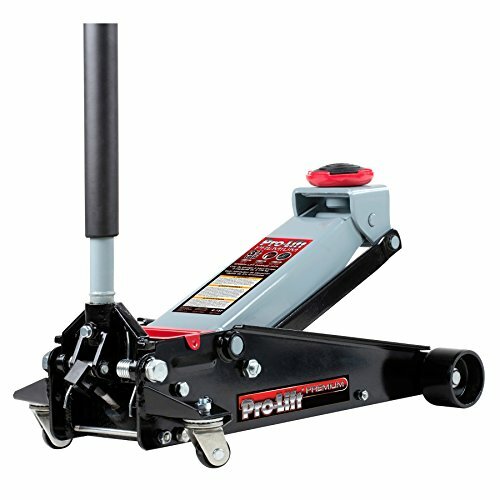 The floor jack in the review group with the highest load rating is the Pro-Lift G-737, at 3.5 tons. Frame strength is a key feature of this unit, thanks to the rolled-steel sides. You also benefit from the universal joint release for great control of load descent. As you might expect, it also has caster-design rear wheels and a rubber saddle pad for stability and protection. At the top of the highlight list with the Pro-Lift jack is the ability to reach your load height with a couple of pumping strokes. Jacks preferred by the professional generally have rubber saddle pads for load security, as well as the just-mentioned release mechanism (universal joint). You will also appreciate the convenient magnetic tool tray. Lift range extends from 5.5 inches to 22 inches. At 30.3” x 6.9” x 15.75” and 90 pounds this is the heaviest of the jacks reviewed. Warranty is 90 days from date of purchase. It’s easy to get excited over the two-pump, full-lift ability of this jack. Other positive features include the rubber saddle pad and the magnetic tool tray. 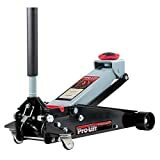 Though the unit is heavy, at 90 pounds, this might be a recommendation factor for the serious mechanic who is looking for a floor jack he can rely on. The rolled-steel side frame is a welcome feature as well. There’s not much to dislike about this beast of a floor jack, though weight might be a problem for some. It would be nice to have a longer warranty from the manufacturer, but you should also check with your seller to discuss this detail. There are really only two types of floor jacks you’re concerned with here: the horizontal, hydraulic lift jack and the vertical, hydraulic bottle jack. There are mechanical/scissor jacks and other mechanical designs, but for these purposes you’ll need to put the power of hydraulic pressure to work for you. The horizontal design is the most common type found in professional shops and the garages of serious do-it-yourself mechanics. Most of the jacks of this type have sturdy metal wheels to provide both a solid base and mobility for moving around the shop. Most also have a two-piece handle with bumper guard protection, with the handle serving as both the method of providing lift and for releasing pressure to lower the jack again. This is usually accomplished with a turn of the handle, which allows the jack to lower slowly and safely. The vertical bottle jack should probably be used with a base or stand of some type to give it further stability. One of the jacks reviewed is actually a combination of bottle jack and jack stand. One of the horizontal jacks has a one-piece handle that is also used to release hydraulic pressure as you would on a bottle jack. Aside from these hybrid designs, you can depend on shopping for two distinct types – the horizontal floor jack with wheels or the bottle jack. The number representing lifting capacity of your hydraulic jack is perhaps the most important number you should pay attention to when shopping. Most of the jacks used in everyday automotive shops and repair settings are hydraulic floor jacks ranging from 1.5-ton capacity to 3.5-ton capacity. There is one good piece of advice when you’re considering which rating to invest in. Don’t just purchase the most powerful jack you can afford because you may be wasting money when you do. The best way to approach the purchase is to think carefully about the amount of weight you’ll most consistently lift with this jack, then buy accordingly. For example, if you’re going to be working with average-size passenger cars and perhaps some SUVs or small pickup trucks, you’ll probably by in the 3-ton range. You may need to go to the 3.5-ton jack for slightly larger vehicles, or perhaps the 2-ton or 2.5-ton units if your lifting needs are a bit lighter. When you are working with vehicles that weigh more than 6,000 pounds, it’s time to look at hydraulic jacks at the next level. There are two ways to look at getting the base width you need in a dependable and safe floor jack. First, look at the overall width of the frame. A more compact jack might be about 13 inches wide while a heftier hydraulic floor jack in the 3.5-ton range might be 15 inches wide. But the second measurement you should be aware of is the wheelbase width. Most quality jacks come with sturdy metal wheels that provide mobility while giving you a good base on which to work. It’s important to take both these measurements into consideration when you plan to add a new floor jack to your arsenal. 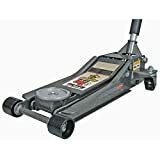 When you are looking for a quality floor jack in the 21st century, you’ll be discussing two metals with your seller or manufacturer – steel and aluminum. The classic floor jacks of the past were made with steel, which made them heavy and somewhat difficult to move. There are steel-frame jacks available today, though it’s best to consider these for professional use or for the do-it-yourself mechanic who has plenty of shop space and plenty of energy to move the equipment from one location to another. You will also find excellent hydraulic floor jacks made almost entirely of aluminum, which naturally reduces the weight significantly. For example, a jack in the range discussed here, made of steel, will weigh about 90 pounds. A jack of similar size made with aluminum will weigh less than 60 pounds in most cases, which means better mobility and less work when changing locations. A third type is the hybrid, which uses both steel and aluminum. Steel makes up a good portion of the main frame, while aluminum is used where possible to reduce weight. Don’t be afraid to go with aluminum for lifting small- to medium-size vehicles. The key is to get the right capacity and to buy a product made by a trusted manufacturer. If you want to separate yourself from those who make the mistake of trusting an unsafe jack, be sure you look for a service jack. Don’t trust a scissor jack or a screw jack to provide the lifting capacity and safety you need to perform regular service on vehicles. A service jack/floor jack is designed for durability and lifting capacity. It’s as simple as that. Capacity is the key element when purchasing a jack, which is why you shouldn’t rely on the mechanical jack or scissor jack that comes with most vehicles. These are for temporary use when changing a tire, for example. They are not meant to be used when you’re performing tasks under the vehicle! A floor jack of the correct capacity for your job will lift vehicles of significant size, and do it safely. You’ve already read about the two primary metals used to make service jacks today. Steel and high-grade aluminum give you the strength and durability you need for the types of jobs you’re performing. 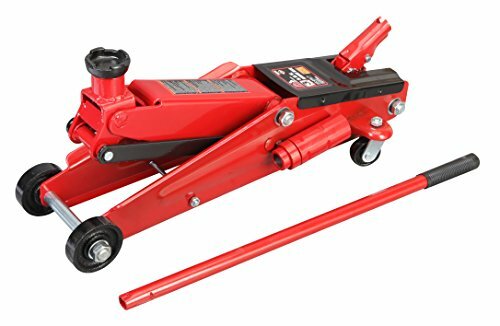 A scissor jack or tire jack, delivered with every vehicle, is made from lightweight, stamped metal and should not be seen as a substitute for a good service jack. Floor jacks are designed to be a serious tool for performing work on cars, SUVs and smaller trucks. Many of them can be placed under vehicles as low as four inches and will still lift to the area of 18 to 20 inches for excellent access. It’s best to leave the inexpensive mechanical jack to its one purpose – changing a tire. Safety is most important when working with floor jacks or bottle jacks. But, as most professionals will tell you, it’s also important to consider the speed and efficiency of the product when you’re investing in new tools. This is certainly true of the hydraulic jack used for servicing automotive vehicles. You don’t want to spend your time pumping that long handle to get your lifting saddle into contact with the surface. The floor jacks reviewed, and most of the quality products you’ll be looking at, are not only durable and strong enough for regular use, they are quick and efficient as well. Because of the dual-pump design and the quality of the hydraulic system you can generally reach full height with just a few pumps of the handle. Each jack will be different, of course, depending on design, but you’ll find the best jacks will reach workable height in as few as three pumps. Even those which will lift to 18 inches or more require only 8 or 10 pumps to be ready for work. There are a few basic steps to properly bleeding a floor jack. If you follow them as described here, your equipment should give you worry-free service for the long term. Extend the ram/piston completely, then release the pressure valve, which will lower the jack. You will probably have to use a standard screwdriver to release the valve. Open the filler plug (not the check valve). Make sure you look at the manual or instructions to be sure. Remove the plug to allow trapped air to escape. Put filler plug back in place. You may have to do this more than once to release all the air. Make sure you can no longer hear air escaping before you consider the task complete. It’s always a good idea to block the wheels that won’t be lifted. Carefully slide the jack under the vehicle so the lift saddle is where it should be to make contact with the undercarriage. Pump the handle slowly until you have solid contact then continue until you have sufficient height to perform your work. Watch this simple video for more guidance on how to use a floor jack. Look for leaks in the four most likely places: ram/piston rod; compression ram; pressure-release valve; fill cap/reservoir. Of course, you should take time to find the source of the leak, wiping fluid away to see if additional fluid appears. If you don’t see the evidence you need, focus on the pressure release valve. You can try purging air from the system as described above. In most cases, you’ll need to replace O-rings or seals. Once you get access, your first step will be to remove the old O-ring and replace it. This can be one of the first places to look for visible leaks. Keep track of any springs below the pressure cylinder. Expose the inner cylinder and inspect the seals. Look for evidence of marks or “burrs” that may be damaging the rubber O-rings. In some cases, a very small “burr” or bump in the metal of the cylinder can mark the seals and O-rings, allowing fluid to leak past in small amounts. The answer to the question, “How do you lower a floor jack?” could be the one used for the punchline of a few old jokes: “Very carefully.” But in this case, you should know exactly how to lower the jack and do it carefully and slowly. When you’re ready to lower the vehicle back into place, simply turn the handle of the jack a small amount, slowly, and the jack will lower gradually. Watch this basic video to see it in action. To get the right floor jack for your purposes, it’s important to match the lifting task to a jack with the lifting capacity that will more than handle the task. Whether you decide to buy an aluminum product, a steel unit, or one that combines the two types of metal, make sure you take time to fit the jobs you’ll perform to the lifting capacity of the jack. Matching your tools to the work that will be performed is the most important factor in this decision. Smaller cars will require something in the 2-ton range (4,000 pounds), while an SUV should be lifting with a 3-ton or 3.5-ton floor jack. Make sure you know the weight of your vehicle before you invest in any equipment.